The first three weeks of January are done and I thought I'd share my Bullet Journal pages with you. Besides the weekly layout pages, I've also taken notes from books I've been reading, notes for co-op class, and more notes on goals and blog stuff I'd like to do. But I thought I'd share the last three week's layouts and my menu calendar page for January. For January, I just made a list of the date and a general theme I'd like to follow for meals this month (top right corner). It has worked well! I'm only planning one week at a time, and trying to stay on track with the budget and following the plan. I always lose momentum at the end of the week, but I know that is how I am, so I'm going to try to focus on doing more at the beginning of the week. I was FOR SURE going to do a weekly review each week. As you can see, that's another habit I need to develop (instead of my review, I just sloshed coffee on the page). The arrows on the left side of the check boxes are items that have been carried over from last week. That's a tip I got from a friend as a way to make them stand out and see what I've been putting off. This year's Bullet Journal is a Lechtturm 1917 Medium . It's a dotted grid that I love! I like this journal even more than my previous 2 years of working in a Moleskine. The pages have a great "tooth" to them, they are already numbered, and it is just a hair bigger than the Moleskine. I'm trying to get better at keeping an index, so we'll see how that goes by the end of the year. Overall though, I'll stick with this layout for a while and try to concentrate on getting that tracker filled in each week! *Links are amazon affiliate links. They help support this blog with no cost to you. Thank you! I love seeing your bujo posts! The meal planner looks great and the weather tracker is so well done. I noticed you read the 12 week year, it really made sense to me. 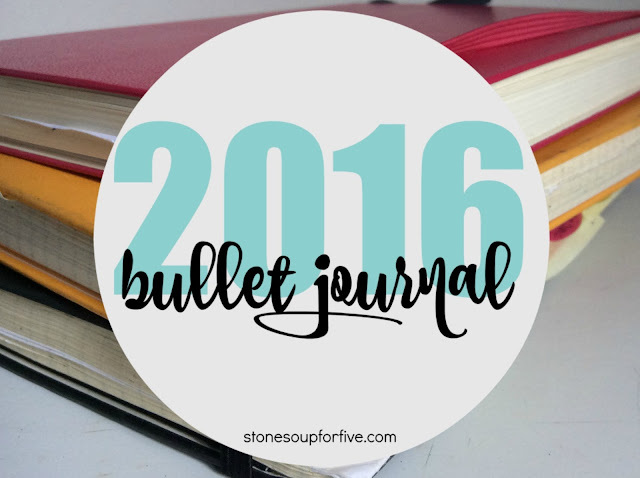 I'm trying to implement what I learned in my plans for 2016. Would love to read your thoughts on it. I love it!!! It looks very similar to my very simple bujo set up. Thanks for sharing. I'm getting some great ideas! I really like your weekly set up. I will definitively be trying that. Mine needed some help! I love the layout of your bullet journal! I am intrigued with the concept of the 12-week year. I'll need to explore that. Please share what OS and T stands for under your book heading? I love this layout. I'm in the middle of a major project and am seriously over planning. I'm getting most of the things I've planned done in a week, so this would be much neater!